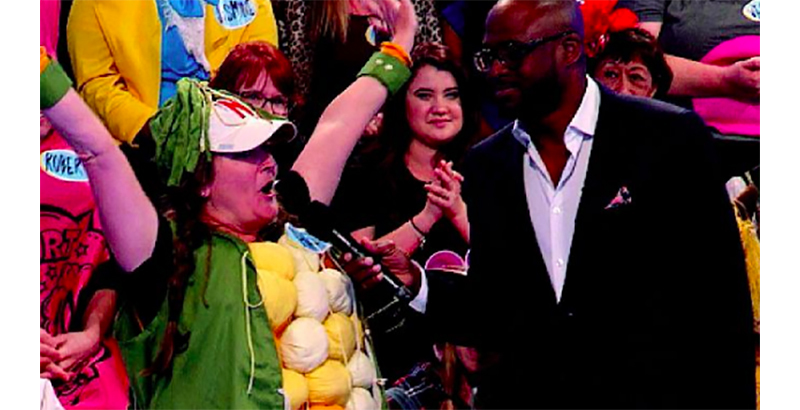 That’s what a Nebraska teacher, dressed as a giant ear of corn, hoped the host of TV’s Let’s Make a Deal would do. And Amy Burns, who teaches special ed at Horizon Middle School in Kearney, Neb., had one of the most a-maizing experiences of her life when Wayne Brady plucked her from the audience to be the first contestant on the Nov. 5 program — and the show-closing “Big Deal” player, too. The whole adventure cropped up after Burns and two friends scored tickets to the game show for an upcoming girls’ trip to California. So, she told Kearneyhub.com, she grabbed a costume that fellow teacher Roni Wilson had created for the local Cornfield to Cornfield 10K run and tossed it in her suitcase. Her two friends dressed as a farmer and a scarecrow. On the way to the taping, Burns told KQKY.com, “They said there were certain parts that you needed to get excited, and I thought, well, I already am high-energy, so 4½ cups of good old black coffee? Let’s do it! And I did it. It was like the whole time, high fives up and down the bus that we had to load up to get to the studio, and we waited there at the studio, we did the wave, we played some baseball, you name it, I was doing it. “Who wouldn’t ‘pick’ corn when you’re on Let’s Make a Deal from Nebraska?” Burns told KRNY.com. She frittered away her first prize, a purse stuffed with cash, giving it up for a television. When another contestant took her TV, Burns chose Door #3 and got a trip to Iceland. “I was like, Iceland? Are you kidding me? I couldn’t even breathe,” she told KRNY.com.